Sony has announced its new range of cameras today, offering a whole host of imaging delights. First up are the T900 and T90 – unfortunately, despite what their name suggests, neither are related to the upcoming Terminator flick. Instead, Sony is calling the cameras chic and ultra-slim, and a quick look at the specs goes someway to confirm the hyperbole. Both make use of a 12.1MP sensor, 3.5-inch LCD touchscreen and 4x optical zoom. And they have the ability to shoot HD 720p movie clips as well. For those who have a bad case of the shakes, never fear, as Sony has added a new Optical Steady Shot feature to minimise blur and shake in pictures. The T90 is the thinnest in the range, with a body measuring just 13.9mm. The T900 isn't exatly portly, with a 15.1mm chassis. Also released is the Cybershot W270. This uses the same 12.1MP sensor as its T-series brethren, but it ups the optical zoom to 5x. It also houses the ability to film in 720p and all the above 'detection' features. There's also a 2.7-inch Clear Photo LCD Plus screen to view your images on. 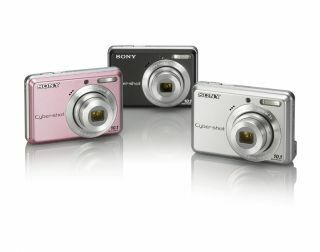 The other new cameras launched today are the S930 – a 10.1MP entry level shooter available in silver, black and pink – and the Cybershot H20. This cam has the best optical zoom of the bunch – an impressive 10x. It also shoots 720p movie footage. Sensor size is 10.1MP. All the cameras mentioned above are available from April, except for the W270 – which will be available mid-March. Prices have yet to be announced.